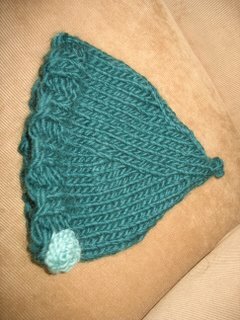 I finished two meathead hats this week. 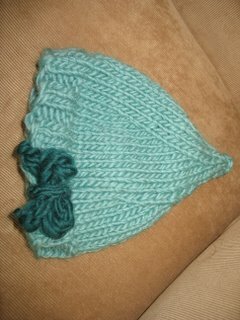 I used the pattern suggested Lamb's Pride Bulky in Seafoam and Pine Tree. I had not previously used this yarn, but liked it, it's a nice cozy wool that's not very scratchy. The pattern uses the yarn doubled so that it knits up on fifteens (I used two Denise Circ's - see that's why I needed the second kit) so it goes pretty quickly. For embellishment, I went for fairly simple. Using the contrasting color I added a fingerknit (ie. loose i-cord) bow and a coiled single chain. I had bought both colors toying with making a striped hat but ended up going with one color. I made the larger size since I have a big head, and that fit well. I tend to knit really tight, so I had yarn leftover, not a lot, but enough that I'll dig through the stash and possibly make a third with some other yarn added in. It's a great pattern and I have enjoyed seeing what others did with it - embellishment-wise and I can't wait for the book.